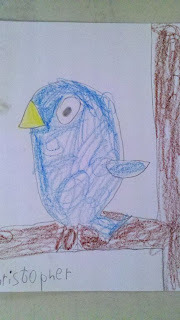 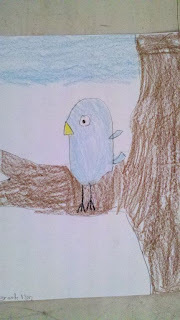 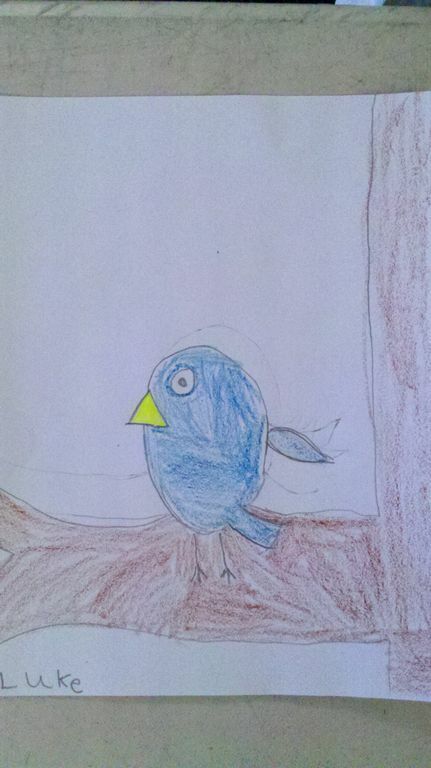 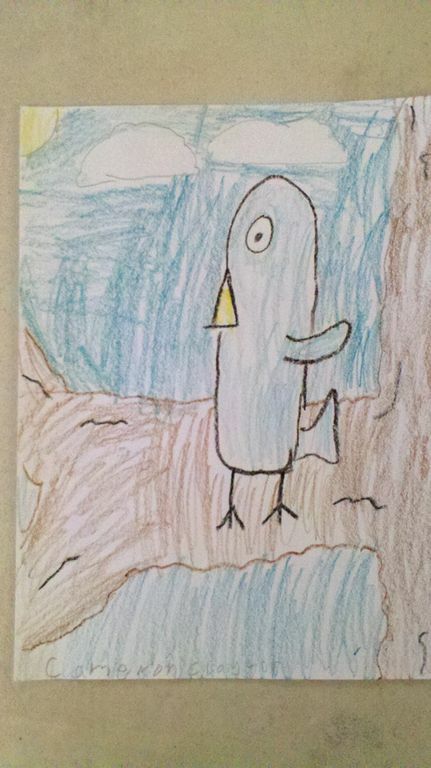 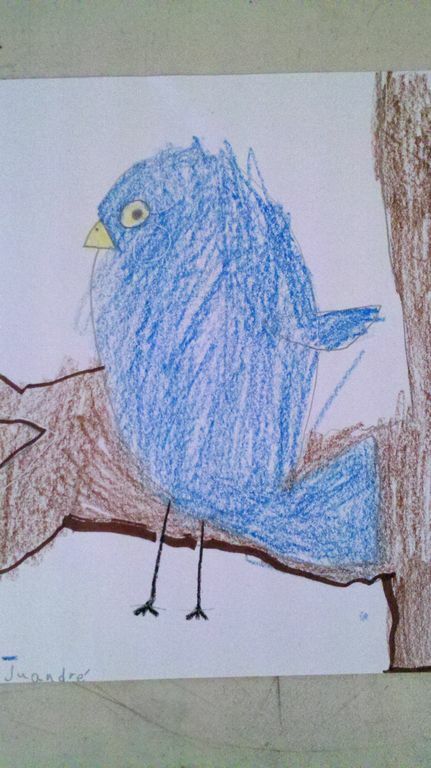 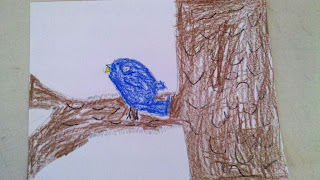 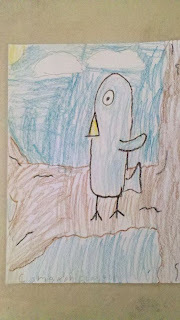 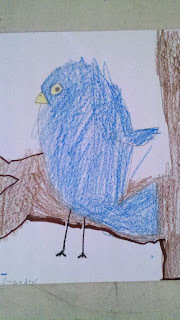 My first graders had fun making their little birds. 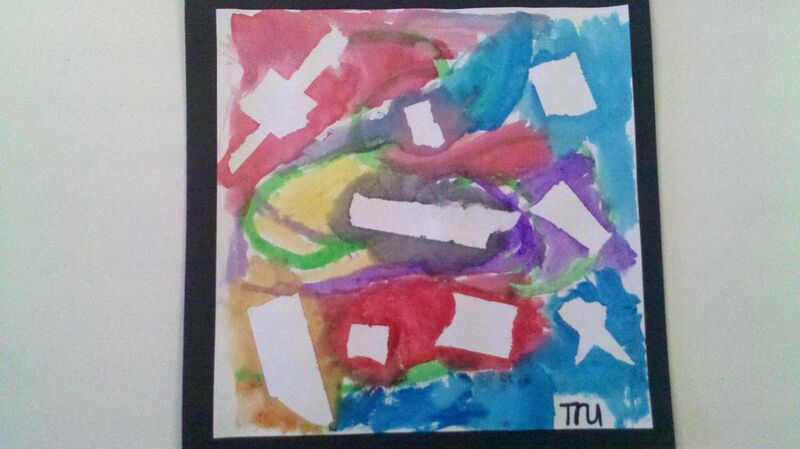 2- 5"x5" pieces of white construction paper for ea. student. 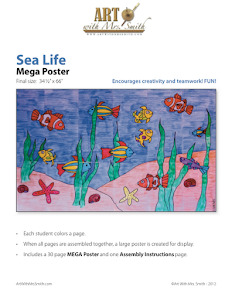 Share some info. 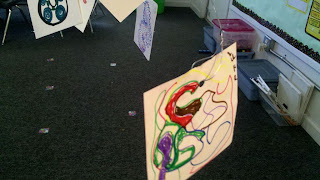 about Alexander Calder. 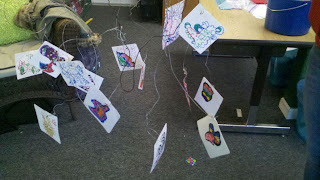 Here's the book I used "Getting to Know the World's Great Artists - Alexander Calder". 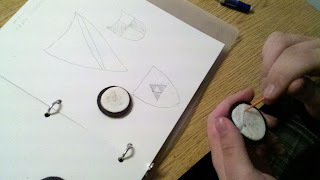 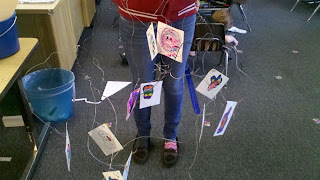 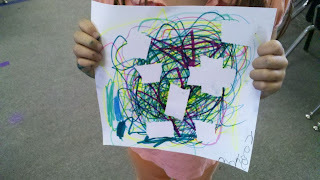 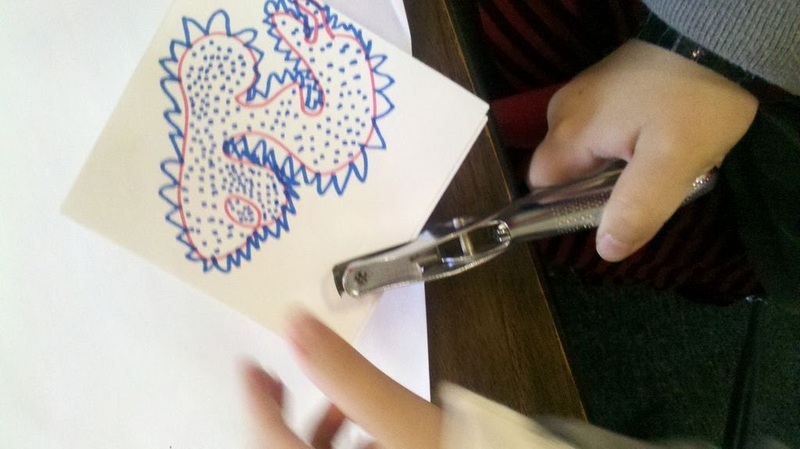 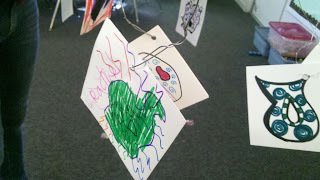 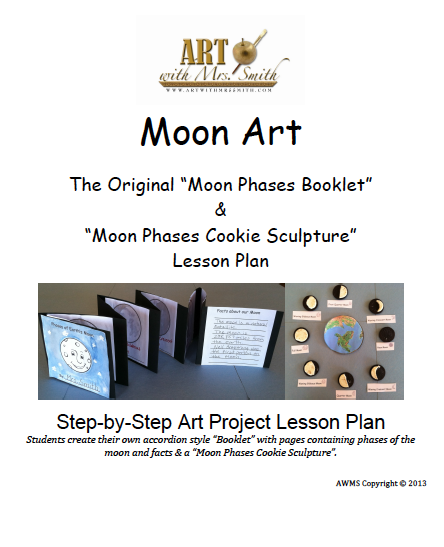 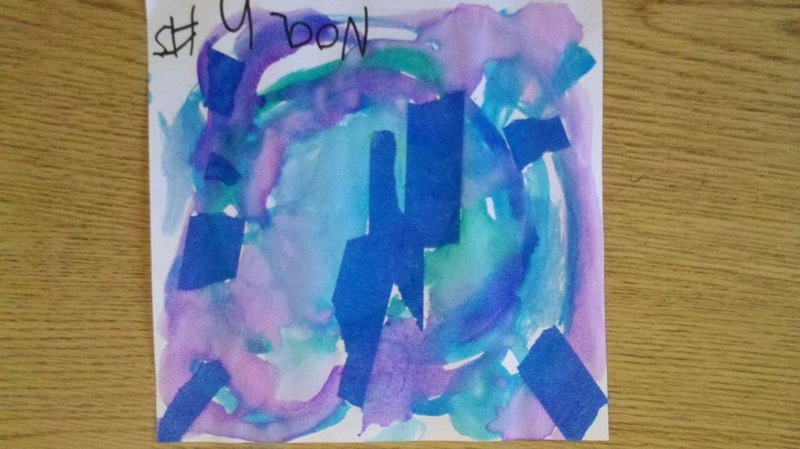 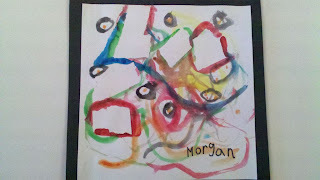 Demonstrate drawing 2 abstract shapes on each piece of paper then gluing them back sides together, and hole punching, adding the wire in hole, and attaching to mobile base. 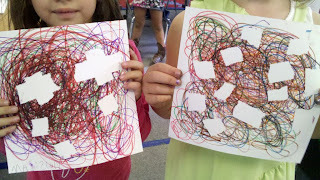 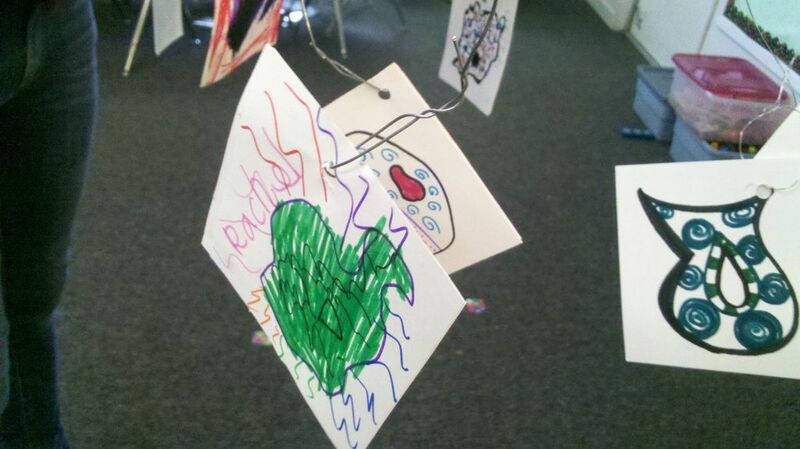 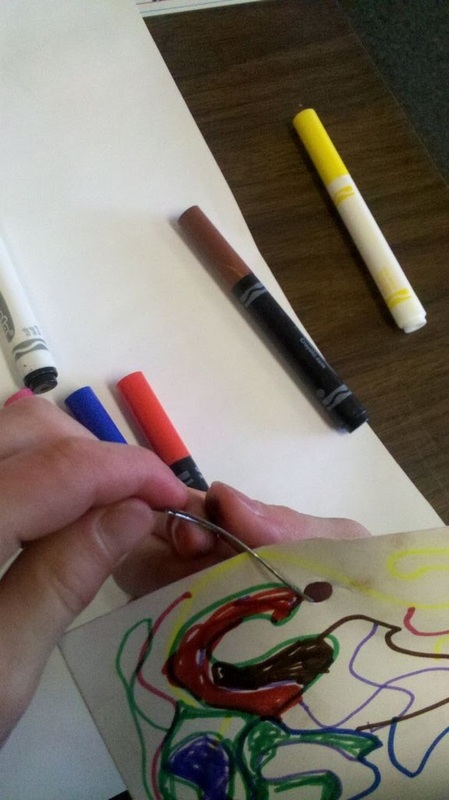 Warn students about treating wire VERY carefully, show that it can poke eyes and fingers and all need to be careful. 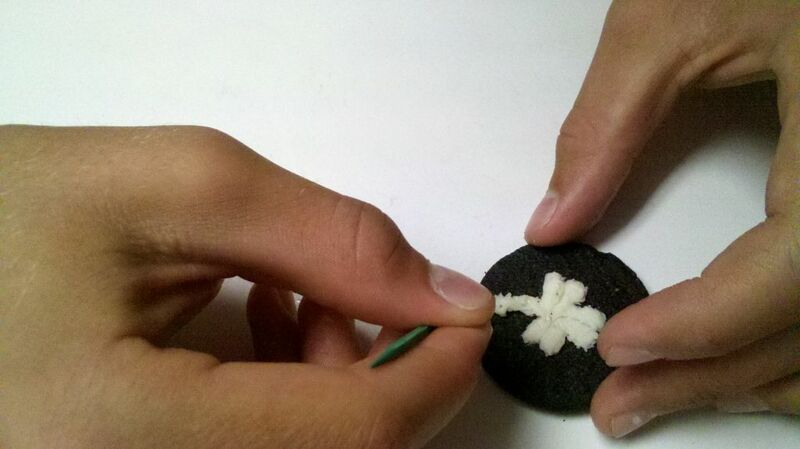 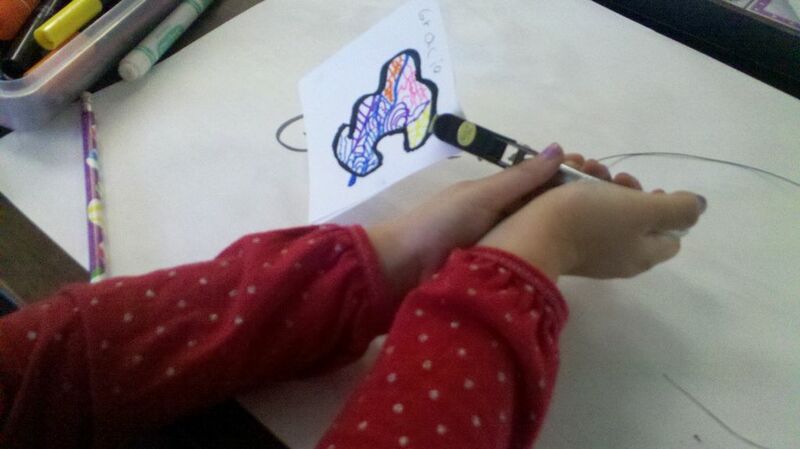 Get students to pinky-swear they'll be careful then set them loose on project. 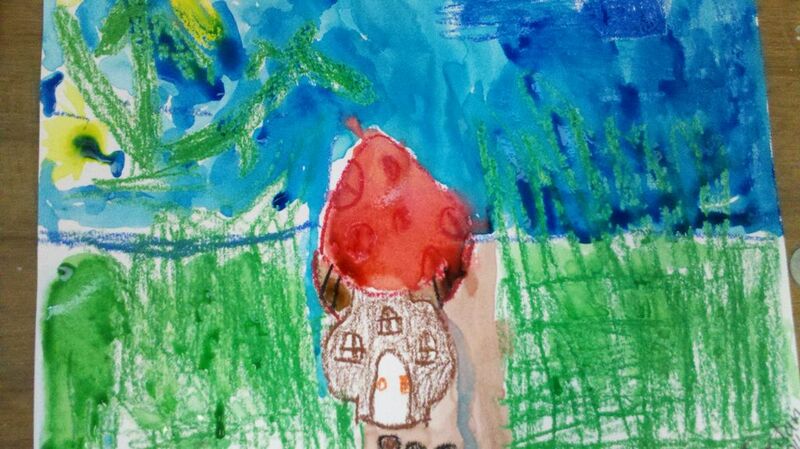 Way to go NCCS 1st Graders!! Oops, where did I see this one? 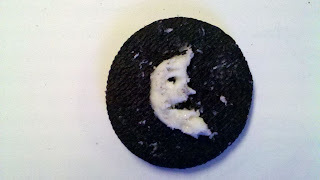 Thinking it was MaryAnn Kohl, but I could be wrong? 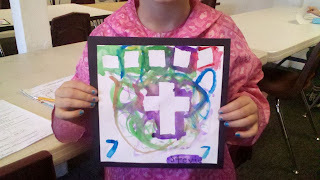 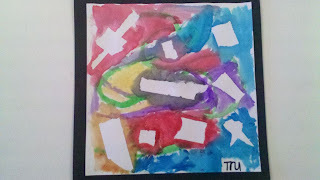 I did this one with both Kinder and 2nd grade, not at the same time though. 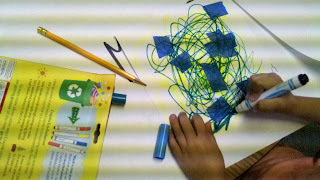 After giving brief info. 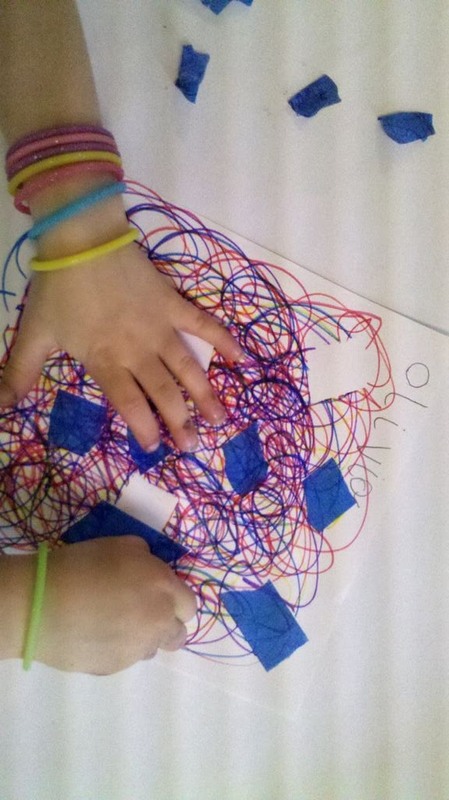 on the difference between positive and negative space in art, students were given 2 strips of blue tape approx. 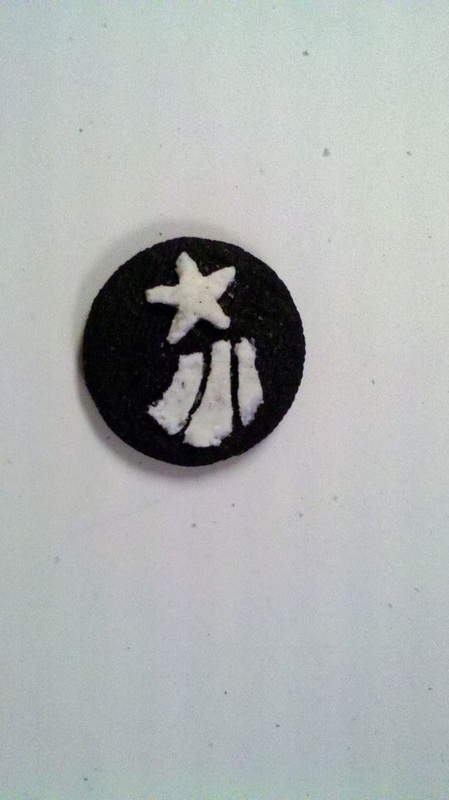 6" long each. 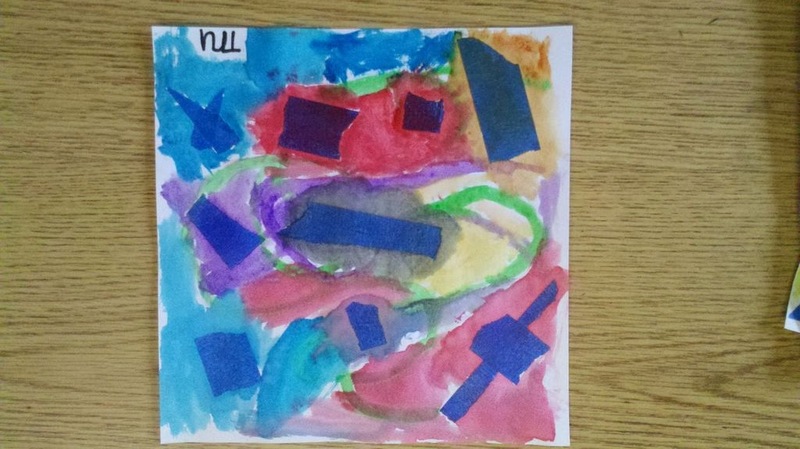 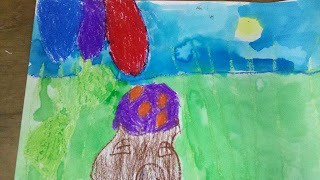 Step two: kinder kids drew many lines on their paper using colored markers, 2nd graders painted over tape and paper w/ watercolors. 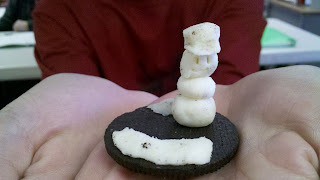 Thanks Pinterest! 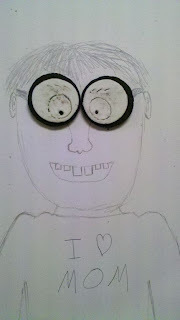 Saw this idea on Pinterest and the original artist is Judith G. Klausner. 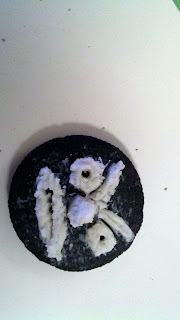 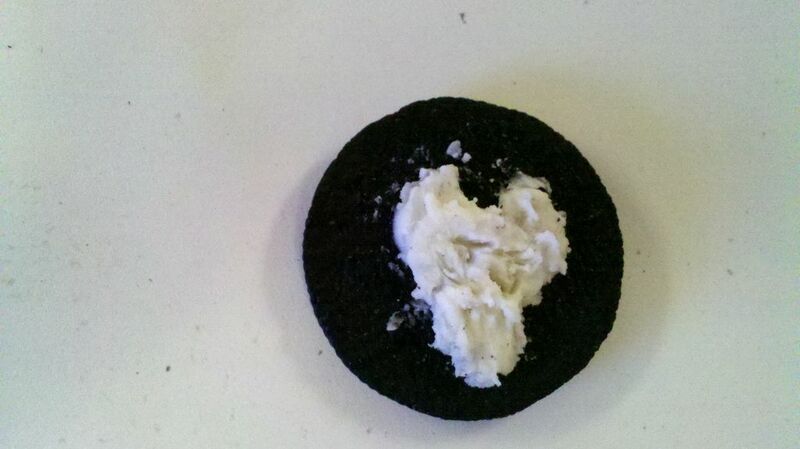 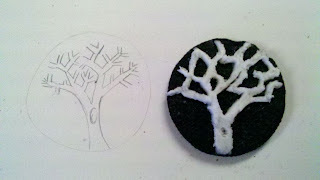 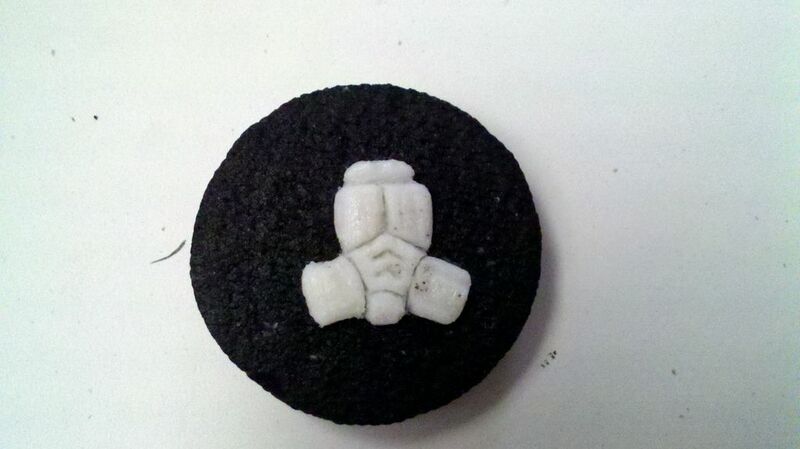 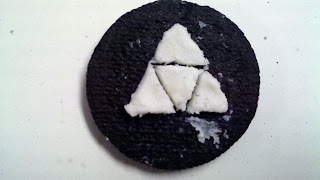 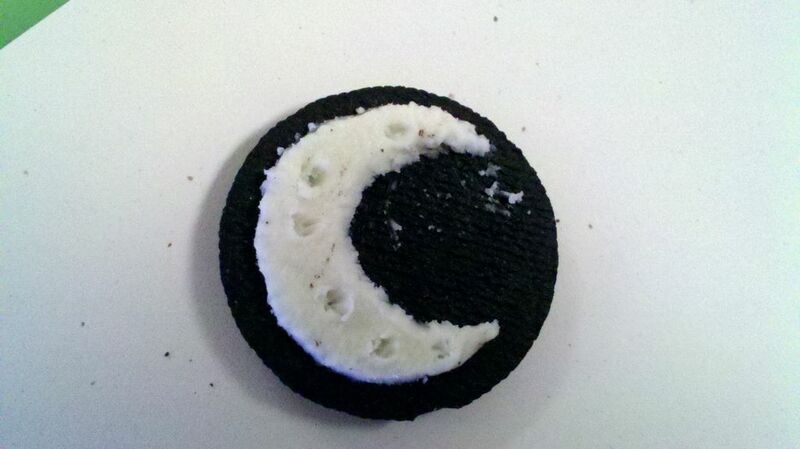 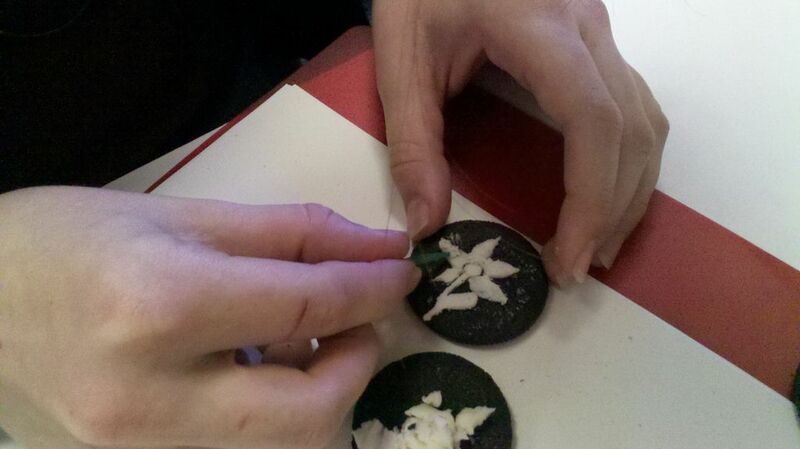 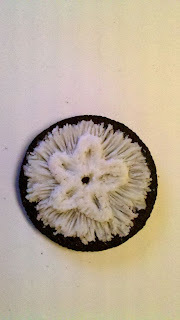 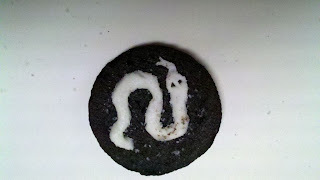 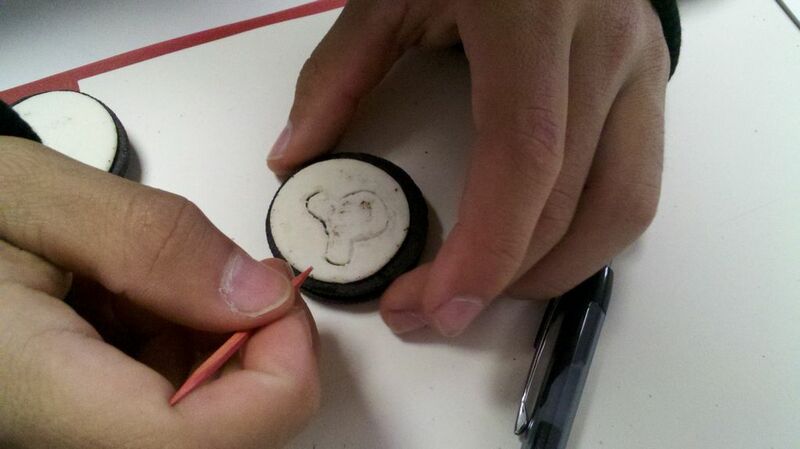 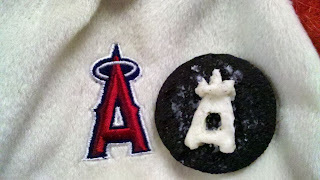 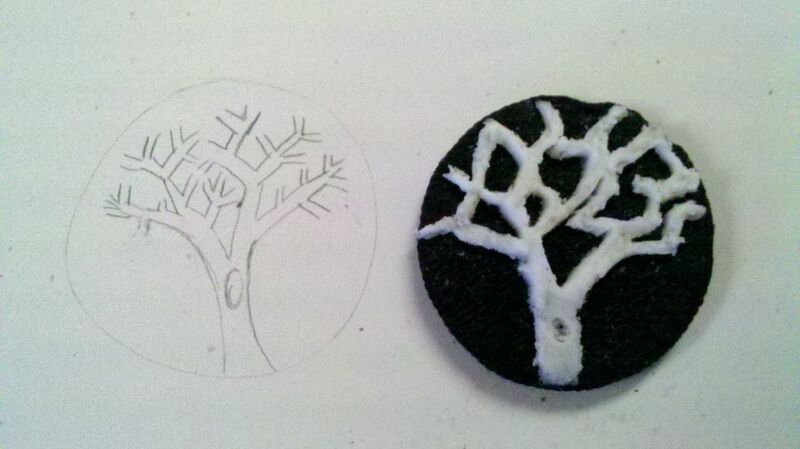 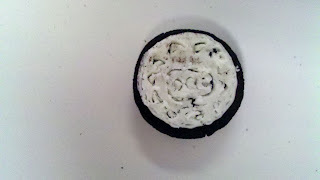 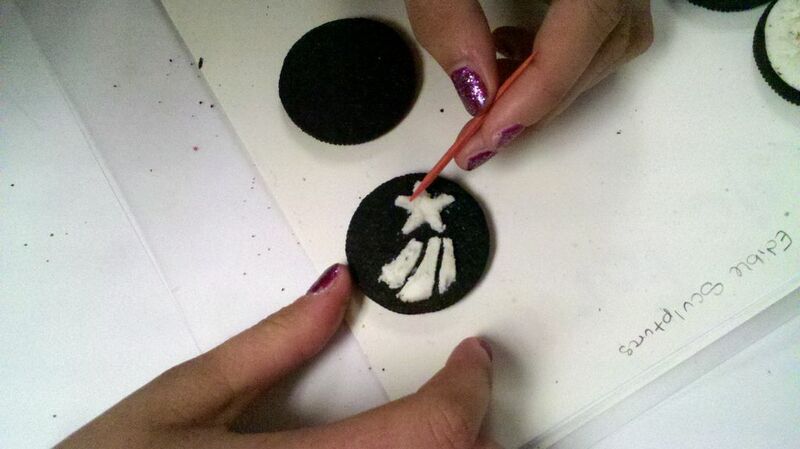 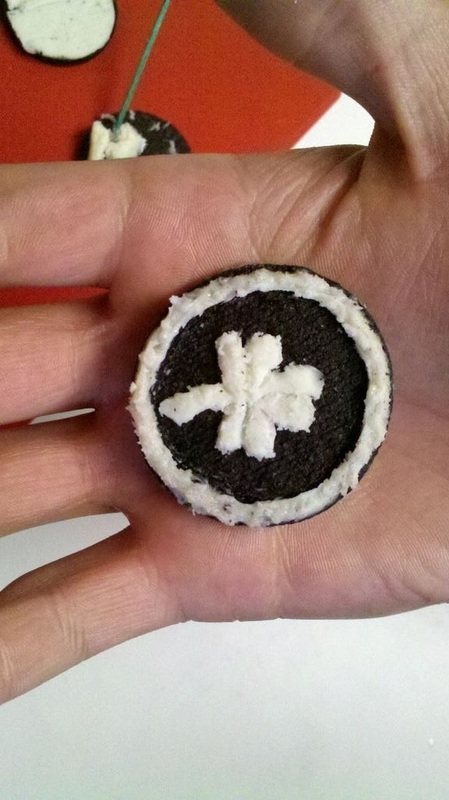 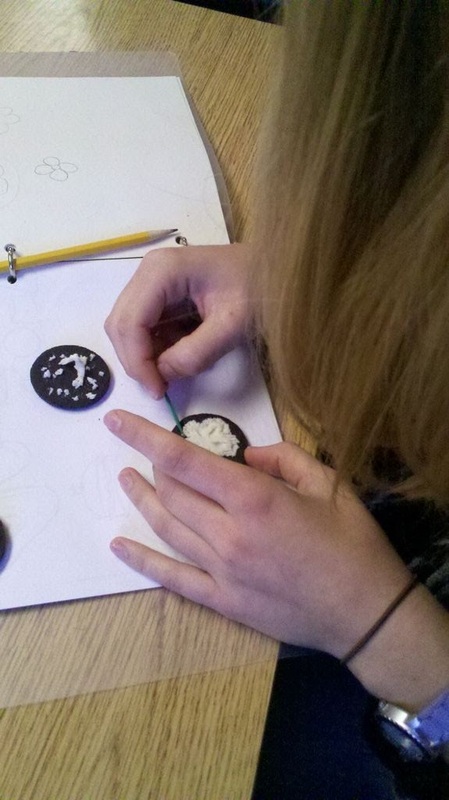 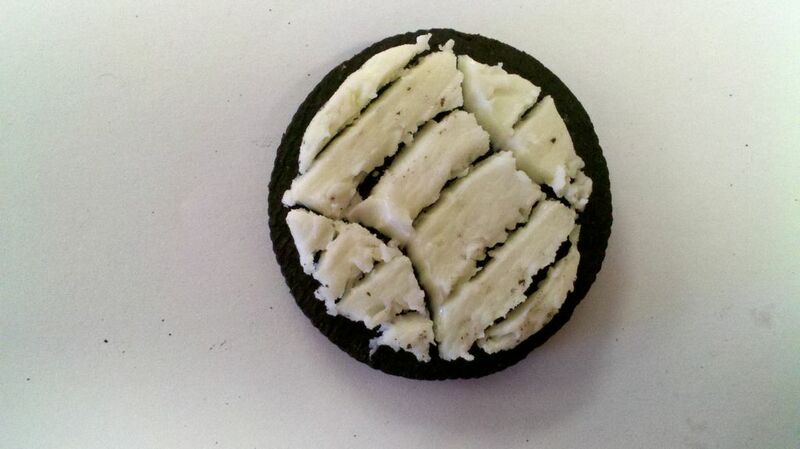 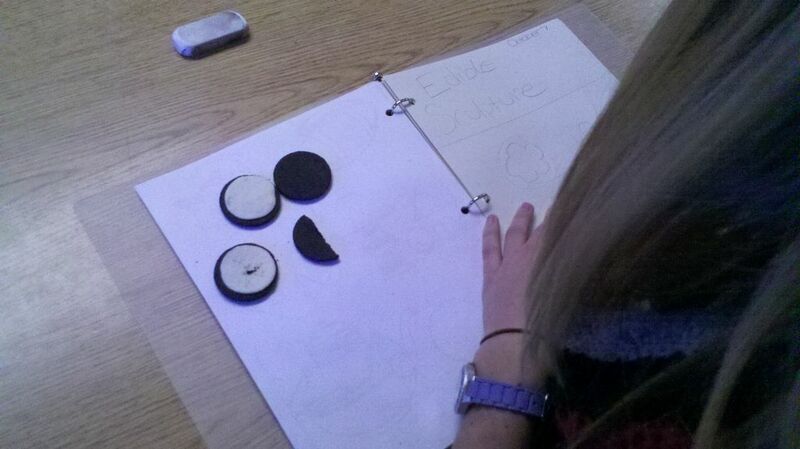 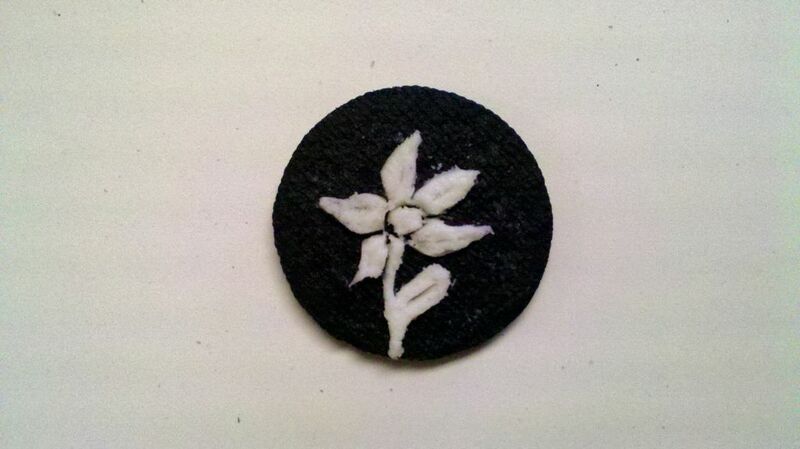 Yes, sculpting Oreo Cookie cream filling on a Friday afternoon works out just great in a high school art class. Students figured out that the toothpick carved much "cleaner" lines when it was kept wet by licking it in between carvings. 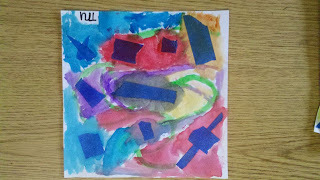 This lesson was for my friend's daughter's 6th Birthday Party. 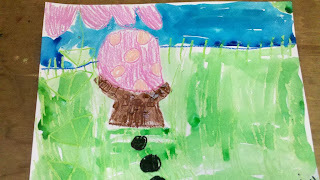 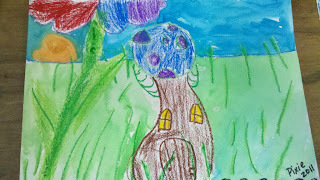 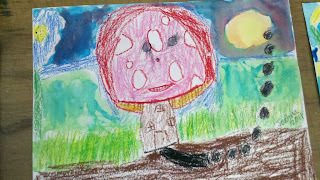 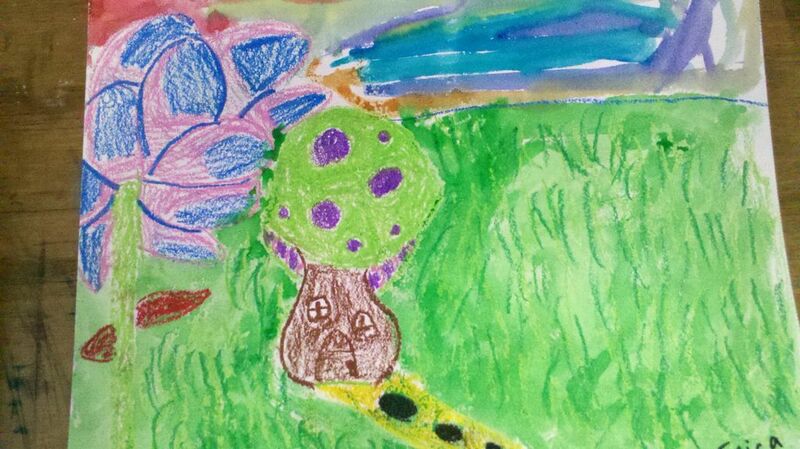 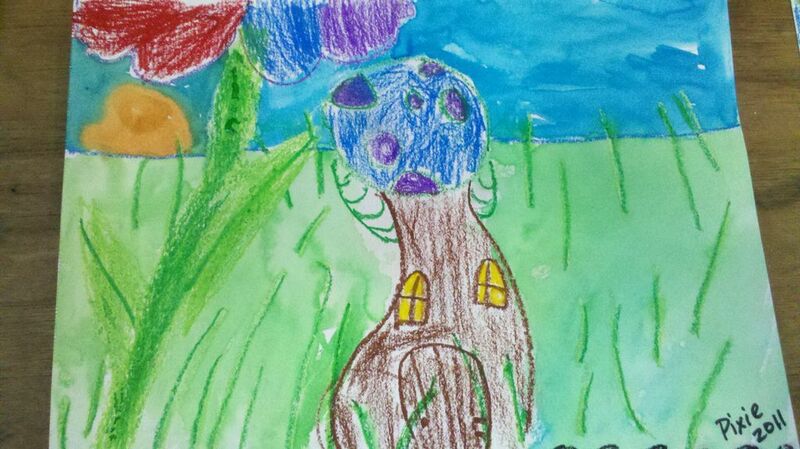 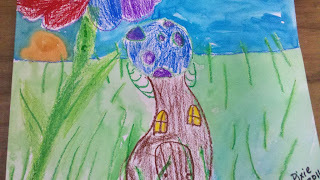 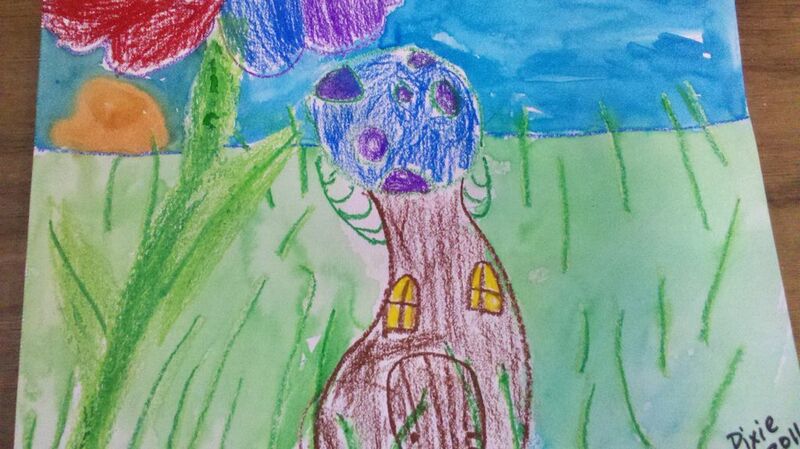 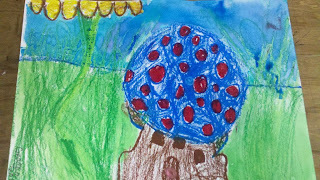 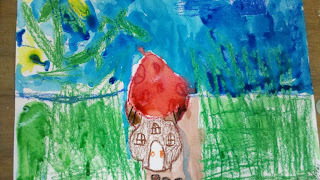 The theme was "Fairies", so we drew mushroom houses for Fairies (the boys' mushroom houses were for Trolls). 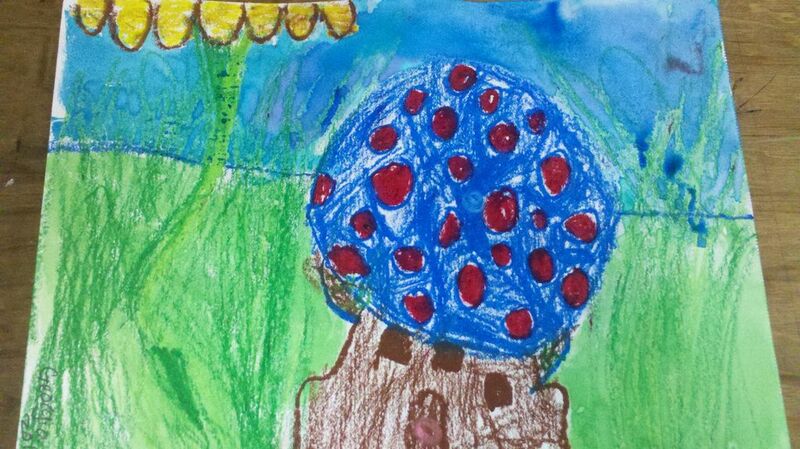 Next to the mushroom, was drawn a really BIG flower to give the perspective of a tiny mushroom house. 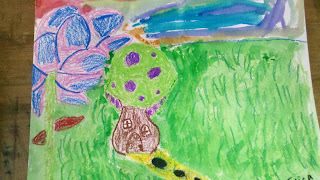 Drawings were in pastel, watercolor on top.